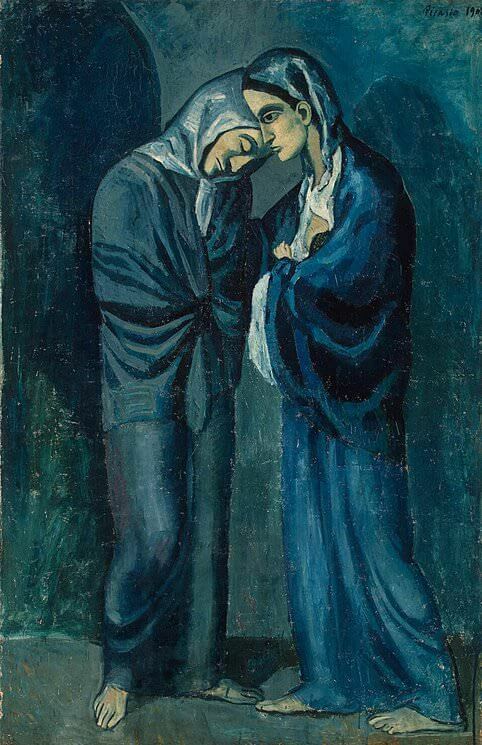 The Two Sisters was painted soon after Picasso's return to Barcelona. In a letter of 13 July, 1902 to Max Jacob he described the still unfinished picture as representing 'a Saint-Lazare whore and a mother'. Picasso's matter-of-fact description might lead one to expect a Lautrecian genre scene, and some of the preparatory drawings do in fact make a faint gesture in the direction of realism by depicting the 'whore' (on the left) in the white bonnet which was compulsory headgear for syphilitic prostitutes in Saint-Lazare, and the 'mother' (on the right) wearing her hair piled on the top of her head in the fashion of the period. But The Two Sisters itself looks like an altarpiece and was executed on panel, not canvas, as if it were a medieval painting. The closest analogy is with Gauguin's paintings about mysticism and faith which match the solemn subject with an archaic style. In Gauguin's Jacob Wrestling with the Angel, for example, a genre scene (pious Breton peasant women listening to a sermon) is transformed by means of the abstracted, 'primitive' style into an evocation of the obscure workings of religious belief (some of the faithful 'see' Jacob wrestling with the angel as they listen to the priest's words). The Two Sisters does not look much like anything by Paul Gauguin, but in its wilful primitivism and oblique religiosity it is Gauguinesque. Indeed, Picasso's sense of affinity with the older artist arose in part from the fact that he too remained fascinated by religious practice and belief, despite his outward rejection of Catholicism and his experiments with blasphemy.